you have to sneak up on new clothing; it's rarely a good idea to give it some grief with any degree of immediacy. even those goretex jackets beloved of the world's explorers have an easy(ish) introduction to life. when was the last time you saw the 21st century amundsen unwrap his red weatherproof only a few hundred metres from the north pole? so a new pair of rapha jeans, specifically designed for kilometre after kilometre of urban grief in the saddle, should not be hassled unduly. and the best way to do that? precisely; i played a three hour gig behind my drum workshop snare right slap, bang in the middle of the islay whisky festival. you remember jura don't you? you must do; we were there last year. you know, the isle with one road that goes ever upwards on the way to the distillery, and bizarrely does exactly the same on the way back. or at least it seems that way. apart from the bit that goes downhill to the ferry. anyway, it matters little really, because jura was the thursday morning destination after the night before. it had been a strange week, not just because it was the whisky festival, but because, used to high winds as we are, storm force in late may was a trifle unexpected. jura is a small distillery, only reached by a ten minute ferry ride from port askaig on islay, followed by that eight mile uphill drive/ride. there are palm trees in the gardens opposite the hotel. a gale force northerly wind was blowing straight down the sound of islay, and reckoned to get stronger as the day went along. to put this in context, the small car ferry would be sailing at a right angle to the wind and strong tide. "if you need to get back, be down here by 1pm". 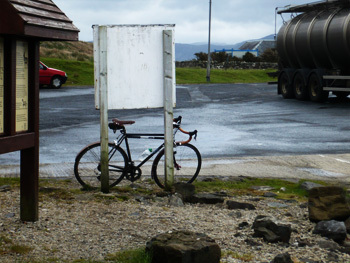 that was the encouraging advice given as i was last to board the ferry after an eleven mile ride from bowmore. categorically wet and windy. as the task in hand required only that i stay long enough to photograph visitors to jura's open day, i expected to be back at feolin a lot earlier than 1pm. in point of fact, i was back by 10:30am after more wind, more hills and more rain. the month of may it might well be, but that strengthening northerly wind was anything but summery. our brand new, £25m passenger ferry was stuck at oban, rumoured to be unable to dock at port askaig due to the weather. not an encouraging state of affairs. anyway, what i have been laughingly referring to as the jura ferry customer lounge was the only point of refuge until the ferry would surely be edging its way across to feolin in a mere matter of minutes. 1pm, they had said, after all. it would be unfair to state that you should never listen to ferrymen, but at that particular point i was sort of wishing i hadn't. 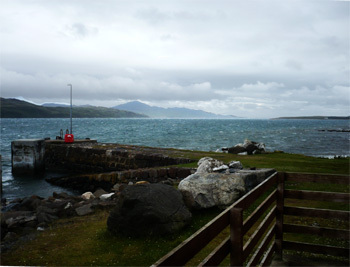 the customer lounge is a brick building with windows overlooking the sound and across to port askaig, so that the disenfranchised can sit and look longingly at the ferry that should be on its way to the jura side of things, sitting not quite still at its berth on the other side of a very rough stretch of sea. in fact, it is apparently quite possible to do stand and stare for around four hours. last monday, the west of scotland was hammered by storm force winds; we're kind of the first port of call, so the great outdoors was a bit draughty. even if wearing a goretex jacket. i know this because a chap who elected to join me in the lounge had been camping on jura's rugged and exposed west coast during the big breeze. he said he'd found a nice sheltered spot, as long as he had no call to move outside. we stood and watched the waves and the ferry still sitting on the wrong side of the sound. for four hours, though i may have made this point pertinent at an earlier juncture of this monologue. why on earth would anyone want to wear a pair of jeans on a bicycle? surely the point at which seemingly every panel of denim joins into a pair of jeans is in entirely the most uncomfortable point for anyone given to riding a bicycle? 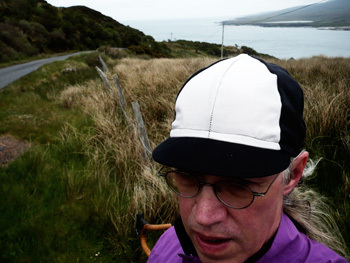 surely there are more cycley items of apparel that would render the act of pedalling a mite more appeasing? somewhat of a rhetorical question, but only because such clothing is often seen as less sartorial in polite company. 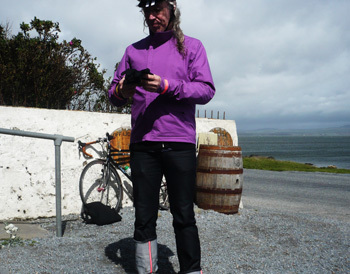 i well remember an afternoon at ardbeg distillery several years back, where shiny lycra was hardly my finest moment. so denim is more of a nod to the world of the civilian than the peloton. 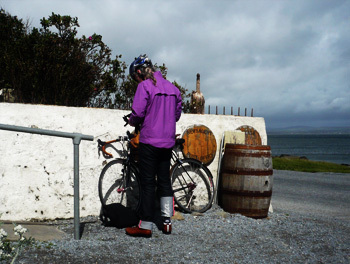 and at the risk of stating the stunningly obvious, a tour group attending the whisky festival do not a peloton make. thus, a pair of quoc pham tourer shoes, a merino baselayer, rapha tracktop, paul smith waterproof (i know, i know; it's supposed to be summer) and a rather smart pair of jeans was my considered antidote to lycra. the latter are not waterproof, but they do take a lot less time to dry than you'd think. agonising seams are a thing of the past; rapha's graeme raeburn spent more than a comfortable length of time riding to perren street wearing regular jeans to find out what wore out and what didn't work. these owe pretty much everything to mr raeburn's tenacity. denim doesn't stretch, at least not in the amounts and planes that the temeritous cyclist desires, necessitating continued research and development into a fabric that contained all the outward qualities of a pair of levis, but all the inner qualities of sir chris hoy's skinsuit. there can be little better by way of advertisement for this fabric than its destructive quality. rapha's jeans first made a brief appearance in the earlier months of this year, but the little coloured dots on the website very quickly turned a browny-red, and neither love nor money could guarantee a pair. because the fabric broke the mill. it has taken nearly three months to have production back to normal, and rapha able to offer the full range of sizes once more. now isn't that the very type of fabric that you'd like to have between those rapha merino boxers and the great outdoors? 1:15pm: the ferry was still sitting at port askaig, but activity had been noted in the vehicle queue. not only had the cars and vans boarded across the rear ramp, but that same ramp had been lifted from the pier, and the blue ferry eilean dhuira headed our way. time to vacate the customer lounge and stand imposingly at the top of the slipway, ready to claim a place on the car deck. 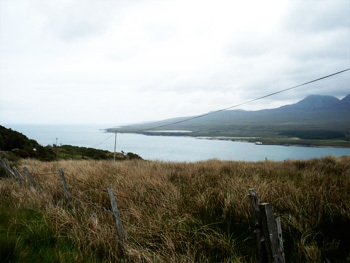 jura distillery's morning events had now come to a close, and the vehicle queue was now several ferry trips in size. despite particularly rough seas and much bobbing about, the ferry approached the slipway and began to unfurl the forward vehicle ramp. and then it stopped unfurling. then it reversed, floated backwards downstream just a bit, before executing a handbrake turn and attempting to head back to the relative safety of port askaig. i was glad for a moment, that i was still stood on solid ground, for the trip back across the maelstrom continually looked as if it might fail mid navigation. the wind, didn't lessen at any point, but almost an hour later, the direction had changed sufficiently for another, this time successful attempt to dock. after that it was simply a matter of doing its job. if you elect to live on an island, ferry travel is almost inevitable. that doesn't mean you have to like it, but i figure that the more often you travel by such means, the less objectionable it becomes. the folks that crew and drive these boats, particularly the rather miniature example plying the islay-jura route, do so for a living, and have their own best interests at heart, as well as ours. thus, a level of trust is not hard to come by. however, after four hours sat in an oversized brick bus-stop, food and drink were foremost in the psyche. 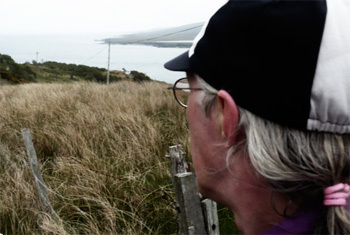 despite the rain and wind, 25km to debbie's for froth and a sandwich seemed the least of the day's worries. those jeans fitted in with the same sense of laissez faire decorum in the cafe as they had done in the cooperage at jura distillery. over the two ensuing days, those selfsame jeans (and shoes, come to that) were deluged, gale-forced, stretched and pedalled in. rolling up the trouser legs reveals bright pink, fluorescent lining on the seams, and a large scotchlite rapha logo inside the right one. in fact, even rolling up the hems when behaving as a civilian has a certain je ne sais quoi; as i stepped onto the jura ferry for a longer than anticipated visit to our neighbouring isle, a young female american pointed to the jeans and exclaimed "those are soooo cool". and my nineteen year-old son was wont to state that it's the first fashionable item of clothing he has seen me wear. it's an accusation i would strongly dispute, but it does speak volumes. made in italy, they're too good for urban, good enough for drumming and excited to be out in the sticks. as i muddle around in middle age, i have become practical. and fashionable. and comfortable. rapha's jeans are available in waist sizes from 28" to 38" in both regular and long leg lengths. though normally a 'regular' sport of guy (30" leg length), those reviewed were 30" waist x 34" long and proved entirely satisfactory, particularly when rolling up the leg for cycling is almost mandatory. cost is £150 per pair. these will last for ever and a day, and come complte with a spare patch of denim in case repair is necessary at any time. had times been different, like maybe now, for instance, cino cinelli would have been a pop singer, touring the same circuit as enrico iglesias, and releasing albums to have middle-aged housewives swoon in the comfort of their own living rooms. three years after the war finished, things weren't like that; certainly not in italy for perhaps obvious reasons. a decent alternative was to set up a cycle company, particularly after having been a professional racer for seven years. a particularly successful racer, come to that, winning the tour of the apennines in 1937, the tour of lombardy in 1938 and milan sanremo in 1943. cinelli's interest in the technology of bicycles was brought on by a series of mechanical failures while racing. since nobody else seemed particularly interested in his observations, in 1948, he set up his own company. something of a family affair, his brother giotto cinelli (not a good name for a pop star) was already in the business of making stems and handlebars from steel, with a factory in florence. cino moved the business to milan which, at the time, was the hub of the italian cycling industry, with about 80 percent of the business being those stems and bars which he was wholesaling through other companies. 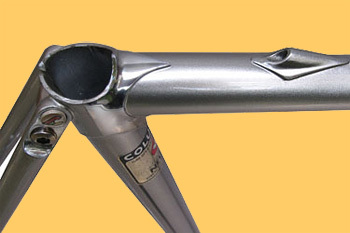 the move to aluminium alloy was made a bit later than most, as cinelli was concerned about strength in the components. eventually, however, demand for the cinelli 'c' on cycle components increased production from around 5,000 in the 1950s to 7,500 in the sixties. a decade later that production was shelling out 150,000 every year. steel bicycle frames were never made in quantities of more than 700 per year. the credibility of cinelli cycle frames, however, took a couple of steps up the podium in 1974 when cino designed an aero bike on which ole ritter broke his own hour record. but the principal seller remained the super corsa, which had begun life a year before the company was officially constituted in the late forties. 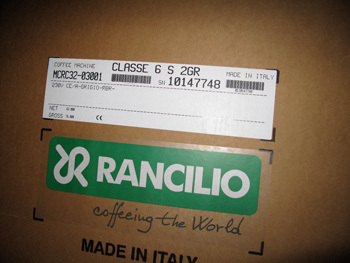 nowadays, cinelli is owned by the columbus company, still a major supplier of steel tubing to the bicycle industry. this sort of makes sense, as the super corsa is still in production today, lugged together from columbus neuron tubing and with the all but extinct steel threaded steerer. hurrah for tradition. of course, time stands still for no italian component and bicycle manufacturer; much of cinelli's current output has embraced the black gold with its smooth, swooping curves which smack more of molds than craftsmanship. cut most of that stuff in half, however, and i bet the iconic 'c' still holds court. 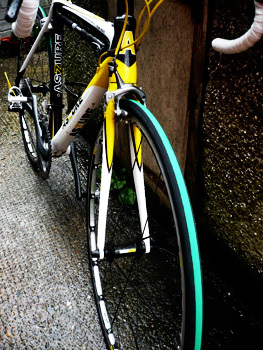 as to the super corsa, we can but dream, or even give phil at mosquito a ring and ask for a build quote. the frame sells for £1599 ($2650). there is, however, a much cheaper way of alerting the great unwashed to one's membership of the cognoscenti. while it may be uncomfortable for the treks and specializeds of this world, much like lambrettas and gaggia coffee machines, the cinelli brand is iconic enough to be known to the average civilian, even if they'd be hard pushed to define just what a cinelli might be. this much cheaper direction will confer not only cognoscenti-ship, but that of educator to the masses. 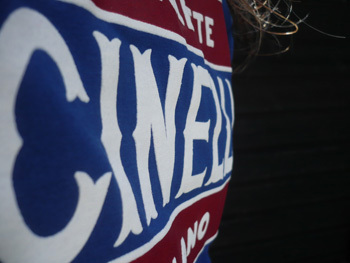 richard at urban hunter has had the great foresight to stock his premises with official cinelli merchandise, an example of which can be seen here. emblazoned in reassuringly substantial screened ink is a most attractive retro print, declaring cinelli to be bicicletta milano. 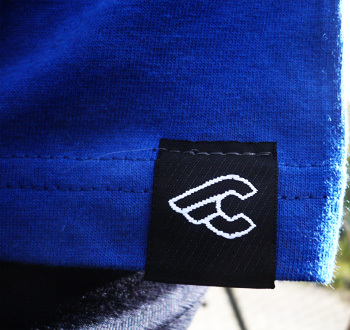 i am unaware of any unofficial cinelli merchandise, but the hang tag attached to the sleeve declares this to be of the official variety, reinforced by a cute little 'c' logo on a sleeve tab, and the word cinelli screenprinted below the collar on the back. t-shirts are rarely my style; the weather never seems to reach melting point up here where wearing such is particularly comfortable, but in this case, i'm honour bound to make an exception. this example simply exudes style, a look i could either destroy or get used to. the cotton is almost disturbingly soft and cosy; wearing seems an almost illicit pleasure. it can also be partnered by other examples featuring variations on the cinelli marque. cheaper? yes, by £1579 and five pence, compared to a super corsa frameset and available in sizes from small up to x-large. i would if i were you. i'll admit it, i have reached middle-class fuddy duddyness; i listen to radio four's, the today show every morning, unless there's a power cut (oh yes, even in may). according to an article in the guardian the other day, the today programme is on an upswing of popularity. more folks are listening now than for quite some time, and even its rather formulaic, repetitive format has gained a considerable number of acolytes. including me. 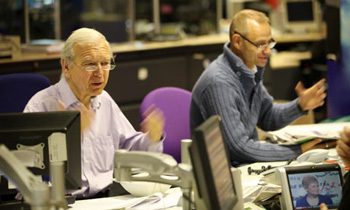 at around 07:15 every morning, a rather knowledgeable chap appears on air to dissect the day's business news, including the exchange rates between the pound, dollar and euro, whose shares are doing what, and a bit where another really clever chap from a random financial consultancy obfuscates anything left unsaid. although it's fascinating to listen to, it is money raised to the level of being an end in itself, rather than the means to an end that it is for the rest of us. i am comfortable with the fact that i understand pretty much none of it. economics always do that to me. 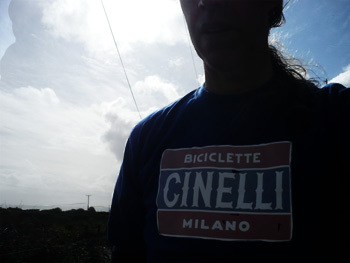 so you will perhaps begin to comprehend why the bbb chain fitted to the cielo has me similarly confused. when taken out the box ready for fitting, i had my doubts. when the power-link thingy was snapped in place, those doubts had not gone away. you see, the snappily named bch-103l - powerline hollow-pin chain professes to be self-lubricating, and due to this technical advancement, it carries a substantial price tag of £64.95. this is sort of where economics comes into play, because though bbb had me convinced that the self-lubrication would continue to carry out its duties for at least 1500km, the cost seemed ill at odds with pragmatism. 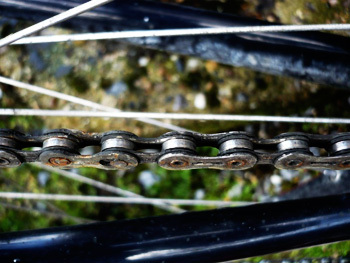 like the good little cyclist i have become, i religiously replace my chain every three months (well, almost), and i reckon to ride an average of 160km per week, thus around 640km per month. that means at the end of three months i could expect to have ridden the same chain for about 1900km, a mere 400km more than the supposed maximum lubrication period of the chain in question. 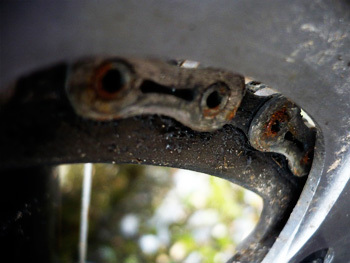 economically speaking, i could have purchased a ten-speed chain from the same manufacturer for a mere £26.95, put a drop of lube on it as required, and still changed it after three months. my favoured chain lubricant is chain l no.5, which costs only £7.95 for a 4oz bottle; i've had a bottle for almost two years and it's not done yet. economics such as these are hard to argue with. unfortunately, that doesn't even begin to cater for the situation's reality. as i removed the cielo from the bike shed this morning to ride over to ardebg distillery for their spanish themed open day, i figured i'd give the bike a quick rub down after its rather hectic past three days. oh dear; that chain, though it commendably has made no complaints over the 800km of pedalling so far, was in an awful state. bone dry, rusty and generally in a rather sorry state. my concern was for those chainring teeth and my ten sram sprockets on the back wheel, so i took pity on it and applied some chain l.
bbb could, of course, attest that such outward distress means not much more than a bucket of lego. as i have mentioned, other than perhaps a degree more clattering than i'd like to hear from my drivetrain, there hadn't been so much as an audible squeak, despite a liberal dousing in seawater (while on a rather bumpy ferry ride to and from jura), scutterings of road grit and isle of wight ferry, plus a large proportion of islay's 1200mm of annual rainfall. i would be remiss if said that i hadn't so far found this impressive, but in reality, not impressive enough. so while the chain will remain powerlinked to the cielo for its alotted period of time, when it is replaced, it will be with one of the more economically priced units. because, aside from any other consideration, there is a certain zen quality to be experienced while dripping a smidgeon of thick oil onto each chain link. i think it may be my birthright. since this video was made, shaun now lives about 40 miles outside town ad has, of necessity, acquired a car. i never know whether to admire those who ride solo around the world or not. at the risk of being crossed off mark beaumont's christmas card list, i'm not sure i can see the point. and in the light of today's troubled world, it doesn't seem like the safest undertaking with which to be involved. however, you can't help but admire the cojones of those who do so; the amount of training, planning and downright doggedness is hard to dismiss. riding thousands of miles on a loaded bicycle decrees a level of obsessiveness that goes way beyond that accrued by most of us, and it must certainly take a certain type of indvidual to even consider such an enormous undertaking. racing, if it can truly be considered such, must take place against the little chattering chappie inside, for the only competitors are self and time. there can be little commercial point in riding around the world unless it's to beat the last person to do so; sponsors always want their pound of flesh, and an entry in the guinness book of records goes along way towards satisfaction on that score. however, though an average number of miles/kilometres must surely be covered day in day out, according to a pre-conceived plan, there is little obstruction to a good night's sleep, before trammeling the same distance in a different country next day. but so-called ultra-distance racing is a whole different ball game (well, rather obviously it's not a ball game at all, but i do like my metaphors), and possibly even harder to come to terms with. 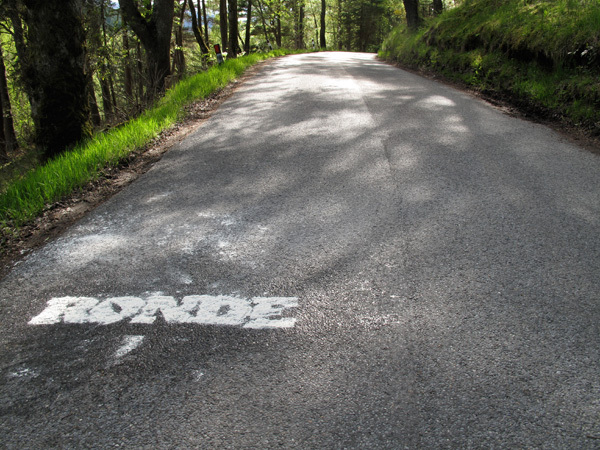 while those currently involved in the giro d'italia cover up to 230km in a single stage, ultra distance racers are probably sniggering behind their gilets at such paltry distances. granted, grand tour riders move a smidgeon faster than their long distance counterparts, but at least they get substantial amounts of shuteye at the end of each day, and a rest day every now and again. perhaps the best known ultra distance event is the race across america or raam, a colossal undertaking half-way between riding round the world and standing on the podium in milan. it's also an event that is not known for its kindness to the body, yet it's almost an open but obscure secret. most of us have heard of it, and possess a vague understanding of what it might be about, but i doubt many could pinpoint the date on which each anual raam takes place. i know i couldn't, and i've just read a book about it. 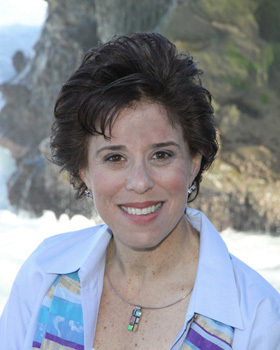 amy snyder followed the 2009 event (starting on june 17 at oceanside pier, san diego. i lied) from start to finish, detailing the struggles and personal victories of each individual taking part. 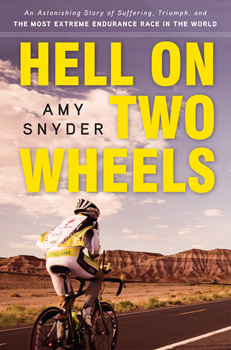 in case you haven't heard of amy snyder, and i confess that until this book arrived, i too was unaware, she is a three-time ironman triathlon finisher; no mean feat in itself. (an ironman event incorporates a 3.86km swim, 180km bike race, and a marathon which sounds way too much like work to me). however, as she says in her introduction "with a little bit of luck, a reasonably fit and determined person can finish an ironman-length triathlon in less than three-quarters of a day of hard racing. i knew i could never push myself beyond this..." as one whose swimming resembles that of a mobile jacuzzi, and unable to run the length of myself, i beg to differ. a raam competitor has a prescribed 3,000 mile (4,800km) to cover, hopefully averaging between 230 and 250 miles per day (370 - 402km). total climbing distance is close on 100,000 feet (30,500 metres) and temperatures range from scorching in the deserts to darned near freezing in the mountains. but that's not the really hard part: all this needs to be completed on around one hour of sleep in every 24. try telling that to bertie and larry. snyder doesn't dodge the fact that it takes a very special type of individual to even think about racing across america, let alone the one who wins, since they will regularly have punished themselves a lot harder than those finishing behind them. and yet it's not just the competitors who have to be wiling to undergo a special form of purgatory; their support crew doesn't have a particularly easy time of it either. when all is not looking good, or sleep deprivation makes the athletes shift their perceptions well off the scale of normal, it's up to those in the following mobile home to rally round, re-frame the real world and keep them heading towards annapolis. is this beginning to sound bizarre? good. the crazy thing about all this craziness is that the competitors are there for the love of the bicycle. that's difficult to deny; would any undertake such punishment for any other reason (there's no prize money at the end of the race, simply accolades that vanish as quickly as they appear)? as with all other forms of bicycle racing, raam has its favourites. plural because there is a women's raam as well as the male event. the former depart oceanside one day prior to the latter, but due to their lower average speed, it's their male counterparts who inevitably reach annapolis first. the purgatory, however, is evenly spread across the sexes. the women's field comprised janet christiansen, michele santilhano, briton ann wooldridge and the enigmatic brazilian, daniela genovesi. six times raam winner, seana hogan provided a salient explanation of one of the disadvantages experienced by the female competitors "i have no mechanism to pee from the bike", she said. "thus, i lose four minutes each time i have to go, which is quite often." though an entirely true story, hell on two wheels reads like an adventure novel, leading to accusations of it being unputdownable. each participant's story is woven as a thread through what is often an exciting narrative. amy snyder has an innate gift for telling a great story, surreptitiously hooking the reader into the goings on across the vast expanses of north america. each step forward, each step backward and those who failed to complete the distance, approaches the complexity of three dimensional chess, yet snyder keeps a clear head and presents the twists and turns with impeccable clarity. trepidation would be a good word describing my initial approach to the book, for on the outside looking in, how interesting or intriguing could it possibly be? a bunch of folks set off from the west coast to ride as fast as possible to the finish line on the east coast, often separated by several hours and hundreds of miles of tarmac. it's hardly the components from which excitement is hewn. yet i read obsessively from start to finish, desperate to find out if the butler did it. it would spoil the story if i named the butler at this juncture, and in order not to inadvertantly do so, i have deliberately kept myself from reading the last few pages. once this review is done and dusted, i'm off to the leather armchair to finish the story. though i will undoubtedly get there before you, i'd heartily recommend you follow in my tyre tracks. the bike shop, and i use the term loosely, was down kyle street, on the right hand side heading towards midton road, just opposite the electric bakery. you could quite plainly see the bulk of the broadway cinema, reminding of the considerable rear extension of crt televisions (remember those?). the retail side of things consisted of two conjoining hut-like edifices just past the sandstone library building. bicycle theft was not quite the industry it is now, and in the late sixties it was quite safe to leave a display of cycles outside the front door all day without fear of unlawful removal. most of the samples were remarkably traditional in intent, from kiddies up to grown-ups. at the back of all this was a large, poorly lit shed in which repairs were carried out. it was usually full to overflowing with ill bicycles. that was benzies. mr benzie, sole proprietor as i remember, was an elderly, curmudgeonly man, perpetually dressed in a brown coat and with a beret worn at a slightly jaunty angle. it could be that the beret started out each day in a more considerate position, but bicyles will do that sort of thing to unsuspecting headgear. having to take an infirm velocipede to mr benzie for repair was the equivalent of penance or punishment; woe betide the child who turned up bearing a cycle that was in less than pristine condition. the man may have had an early form of ocd, but could spot a speck of dirt on a raleigh chain at fifty paces. it was considered less painful to clean the bicycle thoroughly before wheeling or riding it down to the shop. it was also never a good idea to take the bicycle in for oiling or puncture repair. in the former case, you would simply be offered a tin of three in one at a price; the latter would simply result in a humiliating lecture on how he wasn't in business simply to take care of your ineptitude. punctures should be fixed at home with the repair kit every child should undoubtedly have in the shed or garage. of course, much has changed in the town in which i grew up. mr benzie is long gone, as is the shop, replaced by rather anodyne looking flats. the library is still there, as is the cinema, though it no longer shows movies. 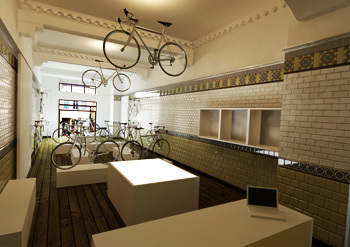 and the art of bicycle retailing has moved on a smidgeon or two. it's not that long since i featured pave in barcelona, one of the more interesting developments in the cycle retail genre i have come across recently. no longer is it simply acceptable to feature a row of bicycles crammed into as small a space as possible, fronted by a price ticket on each, and a stack of inner tubes and tyres concealed behind the counter. life is bigger than that now. neil dryden and neil millsop met around eight years ago when their respective romances concerned two sisters. much like the rest of us, everything that was not romance was cycling; road, mountain biking, cyclocross, sportives, spectating, you name it, they did it. just the same as us. and like many, their regular visits to bike shops were not the fulfilling experiences that a pair of cycling obsessives thought they should be. however, unlike most of us, they didn't mutter under their breath or write extensive blogs bemoaning this salient fact. they observed, and in the course of these observations, made notes. i've pointed out in my opening paragraphs that cycle retailing is experiencing, in certain quarters, a change of direction; the two neils figured time had come to amalgamate their worldly learnings and impose it upon the psyche and spending power of the scottish cyclist. qualifications for so doing? neil dryden comes from a background of graphic design, retail and visual merchandising; the other neil from architecture, interiors and also retail. the cycling addict attribute seems unnecessary to mention. "We love coffee, we love shops, we love cycling, we love bike shops with coffee!" rolling all this together into one enticing package has led to the imminent opening of ronde, which they describe as a bicycle outfitter. i'm not sure mr benzie would have approved, but i'll bet neither of the neils are as scary, nor wear berets. talk, as they say, is cheap; everyone figures that their own venture into the big wide world is different to everyone else's. but in mitigation, why would anyone bother to profess modernity and difference when the proof of the pudding looms closer and closer? a step through the front door will surely confirm or deny. "We wanted to create a shop that would welcome not only the serious enthusiast but the casual enquirer too. Whether you want a fixie to tackle the commute or a Look 595 to tackle the Etape, it's important to get the right advice. We've tried to pull together brands that we love and combine them with a unique retail space and really great coffee. You can come in to buy a Colnago EPS with Campagnolo Super Record, or an innertube; pick up the latest copy of Rouleur, look at the latest photographs from artists like Scott Mitchell, watch stages of the Tour or Giro, enjoy the best coffee in Scotland or just come and experience the love of cycling!" them's strong words, especially in figuring that the coffee could possibly be better than debbie's. that will obviously have to be comprehensively tested at length. so far you are likely comfortably aware that this forthcoming cycling and coffee emporium is about to open its doors in scotland. where, exactly? "We found a great property in Stockbridge, Edinburgh, with lots of great original features. Combined with our individual shopfit ideas, it should create a great destination and meeting place for anyone interested in cycling. We're not naïve or arrogant enough to think we're single handedly changing how cycle retail works, but we believe in the things that have been happening elsewhere and want to present our take on this trend here in Edinburgh." the design is at an advanced stage; what hasn't quite happened yet is translating it into internal bricks and mortar. the illustration shown hereabouts is courtesy of photoshop, but it gives a rather fetching indication of what we can expect. the name is entirely appropriate, for have i not said more than once that the scots are the flandrians of the west (or words to that effect)? bicycles sitting forlornly on a wood or lino floor hoping someone will buy is so yesterday's thing. the sophisticated peletonese about town demands more by way of atmosphere; a smidgeon of career reinforcement is required, even if it's only to give him/her indoors froth to sup and something to look at, while you spend the kids' inheritance on as much carbon fibre as seems ludicrous at the time. and, more importantly, for the benefit of purchaser in those post-sale weeks, months, years. that's what saturday afternoons are for. "We plan to have a rolling programme of displays whether photographic, illustrative, film-based or physical. The only common thread is cycling. By doing this we hope to inform and strengthen the experience of this unique and wonderful sport." 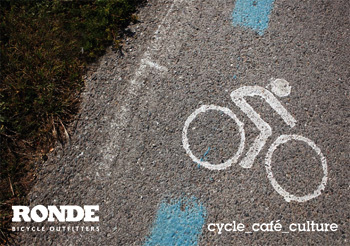 ronde: cycle_cafe_culture will open in july of 2011 at 66-68 hamilton place, stockbridge, edinburgh. there is, most likely, a fine line between a controlled sense of adventure and sheer stupidity. though at its upper levels, this would incorporate such activities as climbing k2 and/or mount everest, making one's way to the north pole accompanied only by those inner thoughts telling you not to, or jumping out of aeroplanes with only a thin sheet of silk between joy and a train wreck. other examples of similar folly are likely to be considerably less impressive. yesterday, scotland was battered by winds above and beyond the call of duty; certainly for the latter days of may. 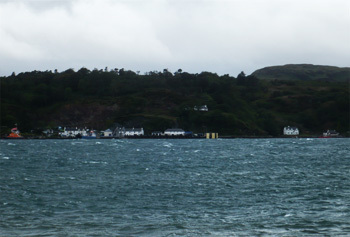 islay is served by two ferries at present; the mv hebridean isles and the mv isle of arran, one sitting at this end of the route, the other safely ensconced at kennacraig on the mainland. in stupid winds as witnessed yesterday, they are probably better staying put, but for reasons best known to at least one of the captains, they set sail for their respective destinations. though i have experienced less than calm crossings in my time, i'm very glad i wasn't on either boat yesterday. according to one of the crew aboard the boat that arrived at islay, they'd recorded a gust of 128mph on the journey across. 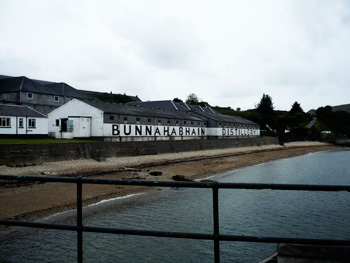 for visitors spending a few days on islay, things can only get better. shifting this adventure/stupidity quotient down several levels, we arrive at me on saturday morning. 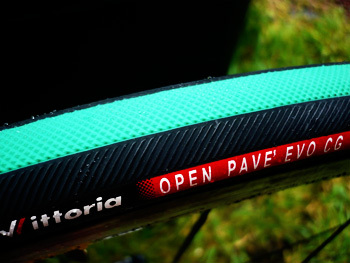 vittoria in italy were most kind in sending over a pair of open pave cg 700 x 24c tyres for review over islay's roads. these are pretty much identical in tread pattern and construction to their similarly monikered tubulars. they are also identical in intent, being the very item vittoria sponsored riders would fit for races such as paris-roubaix and the ronde van vlaanderen. in other words, crap roads. due to agriculture, a more severe winter than experienced for many a long year, and a roads budget that would likely struggle to cover a few coffees and some carrot cake at debbies, islay's roads now resemble a network of potholes linked by scraps of tarmac. my thinking here is that these would provide the ideal hunting ground for black tyres with a bright green stripe down the centre. 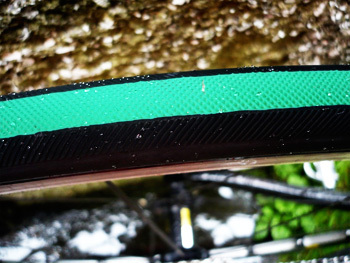 while many of the latest offerings from the world's more prominent bicycle tyre companies are totally bereft of tread, the open paves feature a fine criss-cross file-like tread on the centre strip, supported by an angled tread on each shoulder. this is the stuff of which legends are made, and i cannot deny an overhwelming air of superiority after fitting them to a pair of mavic ksyria on an aszure team issue bicycle. this is where the adventure and stupidity hove into view. though having been forecast for several days, incessant pouring rain on saturday past turned out to be perfectly true. one wonders why it is that the forecast is never wrong when malevolent weather is on the cards? still, pretty much any tyre will behave correctly in the dry; if this test was going to mean any more than a simple perambulation of the estates, looking at least 15kph faster than i actually ride, taking the paves out in the exceedingly wet and subjecting them to the crappest roads kept for special occasions, seemed too good an opportunity to miss. consoling myself with the mantra once you're wet, you're wet., i proceeded to make an idiot of myself for the next 50 kilometres. but aside from smiling often at the lunacy of it all, i'm happy to say that the vittorias failed to join in the idiot making. in a word (well, several to be precise), they were absolutely superb. 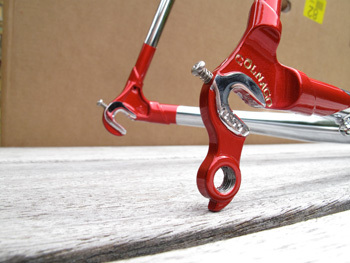 i am extremely glad that i have had the opportunity in the past to ride wheels shod with tubulars, otherwise i would be scrabbling aimlessly for words to support this contention; these have to be the nearest thing to a set of tubs it is possible to ride without actually riding tubs. this is something of a contradiction however, at least from a visual point of view. the open paves have somewhat of a tall profile when viewed from the front (which i try not to do when i'm on the bike). i'd be inclined to equate this with a less than natural cornering tendency; surely a more rounded profile lends itself more to confidence when leaning round corners and bends? seemingly not. those special roads are currently if not permanently gravel strewn, making for skittish riding even in the dry. couple that with perpetual rain, large but irregular potholes, and the beginnings of small rivers, and that sense of adventure begins to look so much more like stupidity. oh, did i mention a herd of cows on the road? yet skittishness was conspicuous by its absence, and a total lack of control on my part once or twice was courageously forgiven by the tyres; down scrabbly hills and round even more scrabbly corners. gravel is not your friend, whatever its publicist may tell you. at least there was no-one around to see me suffer. 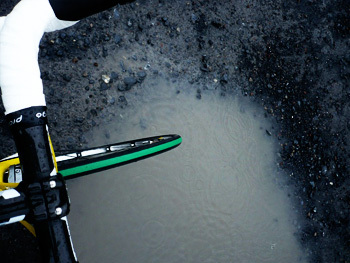 from the viewpoint of getting about in a hurry, weather conditions be damned, the green and blacks are a delight. i may have convinced myself that travel was carried out at a more alacritous pace, but in the face of so much precipitation, there had to be a more pressing reason for that ear to ear smile. of course, the proof of the rubber is just as much in how long it continues to provide those sensations, puncture free, as in how enjoyable when new. i am not unaware of such requirements, and will thus be extending my devil-may-care attitude to weather conditions over the coming months, intent on finding out how well a pair of vittoria open pave tyres survives in the very conditions they were designed to revel in.